There are a slew of fighters with the qualifications to be named the 2012 Yahoo! Sports Fighter of the Year. Juan Manuel Marquez went 2-0 and scored the year's biggest victory, knocking out Manny Pacquiao in the Yahoo! Sports 2012 Fight of the Year. That in many years would have been enough to earn him the nod as Fighter of the Year. This time, though, it is not enough. The same can be said for Robert Guerrero. Guerrero jumped two weight classes to win two significant fights, defeating Selcuk Aydin and Andre Berto. They were victories that put him in the front-runner's seat for a May 4 fight with Floyd Mayweather Jr. It was not, however, enough for the Fighter of the Year. Andre Ward, the 2011 winner, only fought once in 2012, but what a performance he gave. Ward dominated light heavyweight champion Chad Dawson and stopped him in the 10th round. There are years when that one dominant victory could have gotten Ward the back-to-back honor. Not this time, though. Leo Santa Cruz went 5-0 and made three successful title defenses. Carl Froch rebounded from losing the Super 6 finale to Ward in 2011 by blowing out Lucian Bute and then knocking out Yusef Mack. Brian Viloria went 2-0 and unified the flyweight title for the first time in more than four decades. Danny Garcia went 3-0 and became a force at super lightweight. And Adrien Broner went 3-0 and showed signs of developing into a superstar. In reality, though, none of them had the goods in 2012 because of the brilliance of a quiet, understated guy who consistently went out and performed at a high level. Nonito Donaire went 4-0 in 2012, winning a super bantamweight belt and finishing his last two fights. He showed the complete package, using speed, power, accuracy, ring generalship, defense and courage to post decision wins over Wilfredo Vazquez Jr. and Jeffrey Mathebula and stoppages over Toshiaki Nishioka and Jorge Arce. 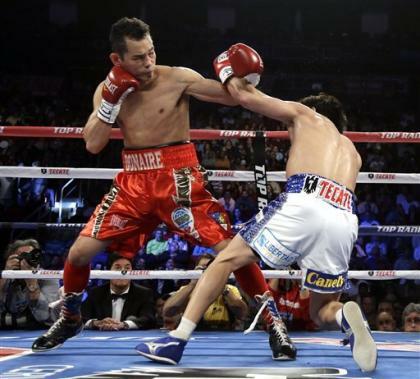 Significantly, Donaire did his job as a clean athlete. He enrolled in the Voluntary Anti-Doping Association program and was subject to random blood and urine testing 24/7/365. He was the epitome of a champion and is a deserving recipient of the 2012 Yahoo! Sports Fighter of the Year award.